This slim new book is the first monograph on the work of Glasgow-based artist Scott Myles, an artist whose work requires some explanation; loaded as it is with elliptical references in need of unravelling and decoding. In past works he has re-presented posters by the late Felix Gonzalez-Torres in double-sided display cases, and cast scoops of ice cream to form bronze paperweights. In 2001 he employed someone to carry out cigarette ‘breaks’ as paid ‘work’ over the course of one day, and in 2002 a project with Dundee Contemporary Arts led a group of children abroad from Dundee, after placing a bottle into the sea that was later washed up and found in Sweden after three years. 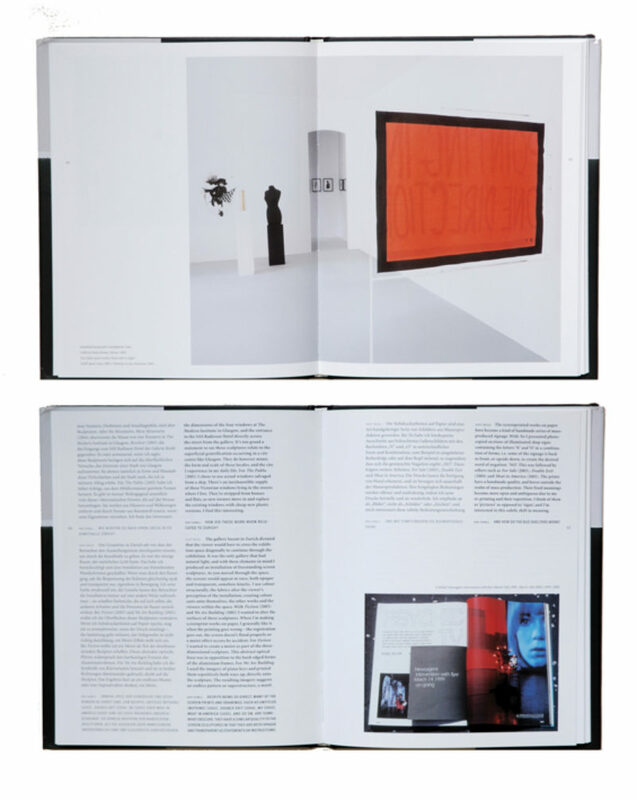 Published by respected Swiss publisher jrp|ringier (known for their distinctive first time monographs of emerging artists such as Eva Rothschild and Kader Attia) this hardback volume is associated with his 2005 exhibition at the Kunsthalle Zurich curated by Beatrix Ruf. The book contains a short preface by Ruf, director at the Kunsthalle, and a thoughtful essay by Caoimhin Mac Giolla Leith. There is also an extended interview with the artist by Rob Tufnell, formerly curator at DCA. The book documents Myles’ work from 1999-2006, the Zurich presentation and other recent shows at Art Cologne 2007, The Modern Institute, Glasgow, and Galleria Sonia Rosso, Turin. And it was of course Ruf who included Myles in the eclectic 2006 Tate Triennial exhibition. In the preface, she suggests Myles employs the idea of contrast, (contrasting notions of the public and private, of transparency and opacity) as a kind of agitator in the work. Viewing the diverse objects assembled in the pages of the book this sense of Myles as a restless agitator seems pertinent. The interview with Tufnell picks up on key episodes from Myles’ formative experiences and specific projects that have come to explain the strategies he uses, for example his studies under the conceptual photographer and sculptor Ken Lum in Vancouver, 1998. ‘This flyer is being used in an ongoing project. The publication in which you found this flyer was stolen from a ‘newsagent chain’ situated in a transit centre I have travelled through’ the publication was then read en route before being replaced onto a newsagent’s shelf in a new location. Scott Myles’. With projects such as this one, the desire to disrupt economic circuits of exchange and meaning in Myles’ work recalls the actions of Brazilian artist Cildo Meireles who silk-screened inflammatory messages onto Coca Cola bottles in Brazil in 1970. Fluxus actions and avant- garde conceptual practice are shown as extending an influence over the artist, but also explained here are other relevant collaborations with the Glasgow Music Collective and The Culture Club (set up with artists Alan Michael and Hayley Tompkins). As Mac Giolla Leith suggests, ‘Scott Myles’s art is an art of misaligned fragments, deceptive shadows, obscure translations and distorted echoes. Often disarmingly simple in form, but invariably rich in its freight of associations, it occludes as much as it reveals’. The book provides a way into a sometimes hermetic practice that doesn’t give up its meanings easily. There is a strong sense of active engagement of the artist in its making with its elegant touches; the end pages use the marbled papers familiar from his angular relief sculptures and behind the cover wrap there is a printed orange double exit sign to be discovered.